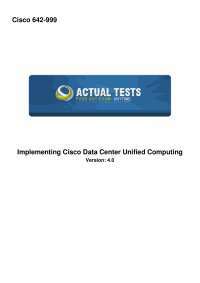 QUESTION 1 When upgrading a standalone Cisco UCS C-Series server, which method is correct? QUESTION 2 In a standalone Cisco UCS C-Series server, which recommendations can be used to upgrade the BIOS? QUESTION 3 What are the default settings of the Cisco IMCCIMC NIC properties on a standalone Cisco UCS C- Series server? QUESTION 4 Which ports can access the Cisco IMC if you select Shared LOM NIC mode in the Cisco IMC Configuration Utility for a Cisco UCS C-Series server? QUESTION 5 Which NIC redundancy modes allow the LOMs to be discovered by the operating system or hypervisor? with an odd numbered port. D. Alternating Ethernet and Fibre Channel ports is supported on the expansion module. E. After making port mode changes on an expansion module, the module will reboot. F. In a standalone configuration, making port mode changes to the fixed module will not cause the fabric interconnect to reboot. A. End-host mode presents a link to a northbound uplink switch as a host trunk with loop detection that is provided by STP. B. For northbound traffic, server MAC addresses are statically pinned to an uplink; the return path is controlled by the unified fabric switches. C. A fabric interconnect port in Ethernet switching mode appears to the uplink switch as a host with many MAC addresses. D. Server-to-server traffic on a common VLAN are locally switched by the fabric interconnect and not the northbound switches. E. A MAC forwarding table is not used to forward traffic to the uplink switch. F. A MAC address forwarding table is maintained for server-to-server communications across VLANs. 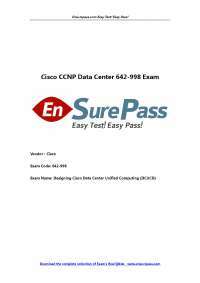 QUESTION 8 What is true statement concerning port personalities on the Cisco Unified Computing System 62XX Fabric Interconnect? B. The fabric interconnects use native FCoE storage ports to directly attach to the SAN infrastructure. C. By default, all Fibre Channel ports are unconfigured. D. The Fibre Channel uplink ports do not support VSAN trunking and Fibre Channel port channels. E. The Fibre Channel storage ports support VSAN trunking and Fibre Channel port channels. QUESTION 9 What is a true statement concerning automatic Fibre Channel pinning on a Cisco Unified Computing System 62XX Fabric Interconnect? A. By default, uplink Fibre Channel interfaces are configured for VSAN trunking. B. Using NPV, each downstream server will be pinned to an uplink port that is based on a PIN group. C. The Fibre Channel pinning process is implemented differently than end-host MAC address pinning. D. With VSAN trunking, the automatic pinning of server traffic to Fibre Channel uplink ports will be based on the server WWN. QUESTION 10 The Cisco UCS administrator has the chassis discovery policy set to "2-link". The administrator connects a new chassis to the Cisco UCS 6200 Series Fabric Interconnects using four links. Which option about link utilization is true? A. The Cisco UCS will use two links until the chassis is reacknowledged, after which it will use all four links. B. The Cisco UCS will use all four links for discovery. C. The Cisco UCS will use only two links. The other two links are unusable. D. The Cisco UCS will use only two links. However, the administrator can manually pin traffic to the extra links by using service profiles. QUESTION 11 Which policy is used to update adapter firmware? QUESTION 13 When cabling a Cisco UCS 6200 Series Fabric Interconnect to disjoint Layer 2 networks, which option must be considered? A. The fabric interconnect must be in switching mode. B. You must first configure a LAN pin group. C. Each VLAN is allowed across multiple disjoint uplinks. D. Each vNIC can communicate to a single disjoint network. QUESTION 16 Which item describes the failure scenario called a "split-brain" in the Cisco Unified Computing System? that are maintained in the remote user account. D. By default, user accounts expire after 90 days; a warning message will be generated 10 days prior to expiration. E. A user that is assigned one or more roles will be allowed the privileges that are consistent across all of the assigned roles. F. All roles include read access to all configuration settings in the Cisco Unified Computing System domain. have access to. C. Customized roles can be configured on and downloaded from remote AAA servers. D. The logical resources, pools and policies, are grouped into roles. E. If the service profile cannot find available resources, it will search in the parent organization for pools and resources. correct flash file system partition. E. It is strongly recommended that you activate all components in all chassis at one time. F. The I/O module, CIMC, and adaptors update process operates strictly on the backup partition of Flash for a given component. QUESTION 21 Which Cisco UCS Manager feature allows you to specify multiple LDAP servers for user authentication? QUESTION 22 Which UCS components firmware are contained in the UCS Infrastructure software bundle? QUESTION 23 Which backup option must be used for a system restore? QUESTION 24 Which protocol is not supported for Cisco UCS backups and imports? QUESTION 26 Which option describes the possible result of a customer configuring a server pool that contains Cisco UCS B200 M2 and B250 M2 blades? A. A service profile cannot migrate automatically from one blade to another blade within the server pool due to hardware failure. B. You must decommission a blade server for the associated service profile to migrate to another blade in the server pool successfully. C. You must uncheck the Restrict Migration box in the service profile to allow service profile migration between blades in the server pool. D. After service profile migration, the server fails in boot from SAN due to differences in PCI device IDs. A. Configure a server inheritance policy. B. Configure a Virtual Media boot. C. Configure a hardware-based service profile with burned-in addresses and identities. D. Configure boot from SAN. E. Configure service profiles with resource pools. QUESTION 29 You have a Cisco UCS B200 M2 server configured with 12 4-GB DDR3 1333-MHz dual-voltage memory DIMMs. You learned that the server memory speed is running at 1066 MHz instead. How can you configure the server to run at maximum memory speed? A. You cannot configure memory speed of 1333 MHz. The maximum memory speed of a Cisco UCS B200 M2 server with 12 4-GB DIMM is 1066 MHz. B. Memory speed of the ESX host is configurable on VMware vCenter. C. Create a BIOS policy. In the RAS Memory BIOS settings, select Performance Mode for LV DDR Mode. D. On the CIMC of the Cisco UCS B200 M2, select 1333 MHz in the Memory Speed option. QUESTION 30 Your systems engineer has determined all of the firmware versions that the server operating system supports. What steps are taken on Cisco UCS to avoid manual firmware upgrades on the blade servers? B. Configure host firmware package and management firmware package policies and associate the firmware policies with the service profiles. C. Create a BIOS policy and define the host firmware package and management firmware package. D. Configure host firmware package and management firmware package policies and associate the firmware policies with the server pools. QUESTION 31 When you create a vHBA, what will you achieve by enabling persistent binding? A. This feature allows the binding of the SCSI targets to the vHBA, even across reboots. B. This feature allows the binding of the same WWPN from the pool to the vHBA, even across reboots. C. This feature allows the binding of the same WWNN from the pool to the vHBA, even across reboots. D. This feature allows the binding of the Fibre Channel uplink to the vHBA, even across reboots. A. In the LAN cloud on Cisco UCS Manager, configure MTU 9000 in the uplink interfaces. B. In the LAN cloud on Cisco UCS Manager, enable jumbo frames in Fabric A and Fabric B. C. In the LAN cloud on Cisco UCS Manager, configure MTU 9000 in the VLAN. D. In the LAN cloud on Cisco UCS Manager, define a QoS system class with MTU 9000. E. In the service profile, configure MTU 9000 in the vNIC. F. In the service profile, configure MTU 9000 in the virtual machine. G. In the service profile, configure MTU 9000 in the uplink interfaces. QUESTION 36 If there are four I/O module links from the Cisco Unified Computing System 5108 Blade Chassis to the Cisco Unified Computing System 6248UP Fabric Interconnect, which dynamic vNICs can be defined? QUESTION 39 Which VMware ESXi 5.0 CLI command will validate PassThru interfaces when they are available? QUESTION 43 Which BIOS setting is required for a VMware ESXi 5.0 host to support Cisco VM-FEX universal pasthrough mode? A. Port profiles define operating-system kernel parameters. B. Port profiles are represented as a port group in vCenter. C. Port profiles can be used by more than one DVS. D. Port profile parameters are visible on vCenter. E. Port profile parameters can be modified from vCenter. F. Port profiles can be modified only from Cisco UCS Manager. QUESTION 49 Which adapter is capable of supporting VM-FEX? QUESTION 50 Which item represents a secure method of transmitting fault data with Cisco Call Home? QUESTION 51 Which item is required for communication between Cisco Unified Computing System Manager and VMware vCenter? QUESTION 52 How many certificates does Cisco Unified Computing System Manager have to export to communicate with VMware vCenter server if the VMware ESXi hosts are all running version 5.0 or higher? QUESTION 53 What is the purpose of the maximum ports that are filed in the port profile? QUESTION 54 What is the maximum number of ports on a VMware vCenter Distributed Virtual Switch? QUESTION 55 In the Create Dynamic vNIC Connection Policy dialog box, there is a configurable field titled Protection. What is the significance of the three choices for Protection? QUESTION 56 How does a dynamic vNIC get allocated? A. Dynamic vNICs are assigned to VMs in VMware vCenter. B. Dynamic vNICs can only be bound to the service profile through an updating template. C. Dynamic vNICs are bound directly to a service profile. D. Dynamic vNICs are assigned by binding a port profile to the service profile.